When you live in a small town, you have to wear a lot of different hats. Here in Paonia, pop. 1,600, for example, the mayor runs a laundromat and carpet-cleaning business and drives a school bus. Many people work several jobs and volunteer at the schools, the public radio station, the ambulance service or one of the town's 20 churches. So when we lose someone, it leaves a lot of holes. On Aug. 18, we lost Robert Hayutin, 34, a father, husband, carpenter, farmer, dump-truck driver, and director of the local Three Rivers Land Trust. At High Country News, he and his wife, Amy Conley, were on-again, off-again staffers and our friends. Amy spent several years working in the circulation department. Every other week for five years, Robert drove over McClure Pass to the printer in Glenwood Springs, then hauled a truckload of High Country News back to Paonia to be labeled and mailed. He also brought stories of the slick roads, mudslides, elk and eagles he saw along the way. A look back at our Dear Friends pages reveals a smiling Amy with their newborn daughter Sabina, in April of 1995. Last winter, we talked about Robert's land-trust work and ran a picture of the bright-eyed trio (HCN, 2/28/00: Dear Friends). After all his adventures at the wheel of the delivery truck, it was ironic that Robert met his end on the road, on the way to work. He died suddenly and unexpectedly when a piece of metal flew off an oncoming truck and through his windshield. Last week, we said goodbye. It was as ecumenical and unchoreographed a memorial service as you could imagine. Some 250 townspeople and family members gathered in the town park, where Robert's spirit - in a Zimbabwean ritual - was called to sit in the center of a circle in a metal folding chair, so that anyone with last words could share them. Then, picnic tables were pulled together for a potluck. After lunch, the congregation headed up to the Cedar Hill Cemetery above town. Amy and Sabina rode up the hill on horseback. The crowd huddled in the shade of a few scattered junipers overlooking the North Fork Valley and Robert and Amy's small farm as Robert's pine coffin was handed down through a line of friends and placed over a hole in the sandy ground. Amy's father, an Episcopal priest, read from the Bible and a friend chanted the Mourner's Kaddish, a Jewish prayer for the dead. A neighbor read an essay about irrigation. A woman called in the four archangels. Someone led a Klingon death ritual. Finally, Robert's casket was lowered into the grave, and the crowd picked up shovels and threw in fistfuls of dirt as the most raucous thunderstorm of the summer boomed up the valley. Since then, the community has done its best to fill the void that Robert left. Weeks before he died, Robert got word that one of the coal mines in the valley planned to bulldoze a turn-of-the-century schoolhouse. He convinced them to hold off so that he could move the building to the farm, where he planned to turn it into a house. Robert never had a chance to see the dream through, but his family will. Out in the field behind the Hayutins' trailer home is a freshly dug cellar hole and a new foundation. 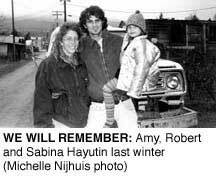 This week, friends put the old schoolhouse on a truck, drove it downvalley and set it on the fresh concrete, which is inscribed "Robert, Amy and Sabina Hayutin, 8/28/00." A memorial fund has been set up at our local bank to benefit Amy and Sabina. Checks made out to Amy Conley Hayutin can be sent to the Memorial Account for Robert, c/o Paonia State Bank, P.O. Box 597, Paonia, CO 81428. The valley's bumper fruit crop has brought a few visitors through this month. Among the fruit chasers were subscribers Al and Gloria Heath, who have a summer home near Gunnison. With them were Karen Aokisson and Ed Bryant, who recently retired in Houston, Texas. Chuck and M.B. McAfee of Lewis, Colo., harvested the first copy of Living in the Runaway West, our collection of columns from Writers on the Range. They stopped by on their way to a Southern Utah Wilderness Alliance event in Aspen. M.B. is the president of the Great Old Broads for Wilderness. Also interested in our new books were Stephen and Cilla Garvan from Niwot, Colo. Stephen is a publishing consultant and talent manager and provided a bit of constructive criticism on the books. Subscriber and art therapist Sandra Laemmle of Lyons, Colo., visited. She lived in Paonia from 1973 to 1978, when she was Sandra Getzler. With her was another former Paonian, Sue Goldstein, a Waldorf teacher in Santa Cruz, Calif. The two were in town to visit their old haunts and to spend a few days in a cabin on Grand Mesa. New Paonia resident Eleanor Zoeller also dropped by. Eleanor moved here from Chicago a year ago, and already knows the names of just about every HCN staffer. She even knew Senior Editor Paul Larmer's kids, 10-year-old Zoe and 7-year-old Zachary, who put together a jokes section for the local Valley Chronicle. We suspect it's not the last time Paul will be outdone by his talented offspring. We blundered with a few numbers in our story "Home is where the heat is" (HCN, 8/28/00: Home is where the heat is). We said the "wildland-urban interface" encompasses 139 billion acres. The correct figure, says Ed Nesselroad with the Forest Service's Region 1, is 139 million acres, which includes forest edges and rural areas such as Hamilton, Mont. Hamilton sits in Ravalli County, which we said has grown 41 percent per year over the last decade. Actually, since 1990, the valley's population has grown a total of 41 percent, says the county's director of land services Jake Kammerer.